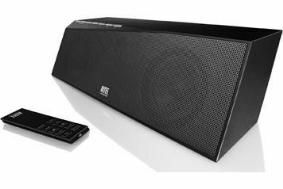 Altec Lansing delivers wireless home stereo with inMotion Air | What Hi-Fi? But what it does do is play music, internet radio or other audio content from your computer or portable without a wired connection. A wireless adapter hooks into your computer and can transmit stereo audio up to a range of 100 metres. Alternatively, users of the iPhone, iPad, Droid and other portable devices can stream via Bluetooth to the inMotion Air, which has a rechargeable Lithium-ion battery capable of up to seven hours playback. It incorporates the apt-X Bluetooth codec for superior sound quality, and the Bluetooth Class 1 system used cuts down on interference to wi-fi networks and cordless phones. Two units can be linked to the same transmitter for basic multiroom playback, and the remote gives control of iTunes and Windows Media Centre. Available in slate black or gunmetal, the inMotion Air has top-mounted controls, a soft-texture finish and built-in handle. It costs around £180-£200 and is available from Apple, John Lewis, Dixons and PC World stores.